Having traveled to 149 countries in my 82 years, I consider myself a perfectionist. I am always looking for faults and/or problems during my travels. The room and/or bathroom was not clean; the front desk staff was not helpful; the drivers (taxi, car service, tour buses) were non-caring; the food was overpriced and of poor quality, etc. I rate a trip on a 0-5 scale. It is tough to get a zero or a five. I recently returned from a two-part trip to France. 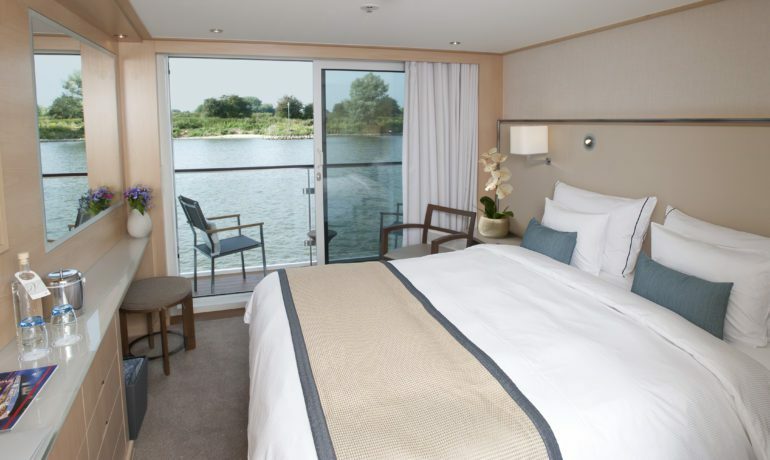 Viking River Cruises invited me on a seven-night Bordeaux River Cruise. They gave me a single cabin on the Viking Forseti, plus roundtrip transportation on Air France. I added a two-night stopover in Paris before the river cruise. My Air France flight arrived at 5:30 a.m. and the pre-arranged group ground transportation pickup (I was the only passenger) to my hotel arrived after a 20-minute wait. I later found out there was a strike by gasoline delivery workers and gas stations had long lines. My driver was waiting in one of those lines. The previous cruise (like ours) had the 190 passengers off the ship by 10 a.m. so the rooms and public areas could be cleaned. The Forseti is 443 feet long with 95 cabins. My cabin #325 was ready and in a few minutes, my luggage arrived. The king bed (two twins put together) took up most of the room. There were two side tables and a sideboard that ran the length of the cabin, with a fridge and drawers for clothes, as well as a desk with a bench and a large-screen Sony TV. The closet had room for my hanging clothes as well as a safe. To conserve electricity, one’s room key was used to control the lights and power. When one left the room and removed the key, the lights and air-conditioning went off. My first meal was a lunch buffet in the lounge area (3rd floor, same as my room level). The library and two computers were located there as well as the best Wi-Fi signal, which did not work in the staterooms. If we did not want the breakfast and lunch buffets in the second-floor dining room (dinner was from a menu), one could eat at the far end of the lounge, both indoors and outdoors, with lighter fare. I tried it several times. There were three floors of rooms, with the first level having only a porthole whereas the second- and third-floor rooms had small balconies with two chairs and a small table. One side of the ship had mini-suites. The top deck was partially open for relaxing. The Captain also had his operation room there. There was a scheduled city walking tour in the afternoon, but it was canceled due to the pouring rain. I used the free time to explore the ship and book several additional tours. Journalists traveling as guests of Viking are given a $200 credit to use for optional tours, which are offered every day and included in the cost of the trip. 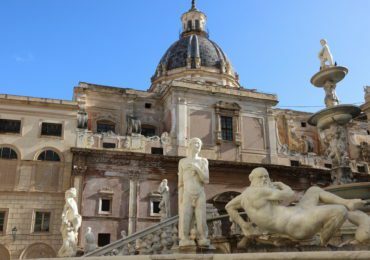 In addition, there is a varied choice of optional tours available at additional cost. had a suggested gratuity separate from everyone else, which I found strange since she was part of management that included the chef, food and beverage director, captain, first officer, housekeeping director, general manager and front office manager. Also note: wine, beer, and soft drinks are complimentary with onboard dinner and lunch. They also have the Silver Spirits Beverage Package that included most spirits, mixed drinks and premium wines at $30 per person per day. The rest of us had a white and red house wine as well as non-alcoholic beverages with meals. Dinner started at 7 p.m. I decided to sit with different people at meals since I wanted to see where guests came from and also if they had been on a Viking River Cruise before. There were many doctors, lawyers and retired folks, mainly from the United States. Several were veteran Viking customers. There were several interesting coincidences. I ran into John Helion who had been the assistant wrestling coach at Columbia, my alma mater, 30 years ago. My next-door cabin mate went to Columbia in the same class as my younger brother. Another passenger recognized my name. We were in the same fraternity at Columbia (a few years apart). It had stopped raining when I went on the evening stroll (2 ½ hours). This was the last night of the River Festival and we stopped at Place de la Bourse to watch the fireworks. The Fontaine des Trois Graces is at the center of the square. We then took a tram back to the ship. The modern tram system began operation in 2003 and now covers 41 miles. It uses ground-level power supplies that avoid overhead wires. A ticket costs about $1.65 US. Sunday morning we had a three-hour city tour by bus and foot. Included was an inside visit to the Museum of Aquitaine that highlights the history of Bordeaux. We spent some time at the Places des Quinconces, one of the largest squares in Europe. The city of Bordeaux has a population of about 250,000 and is visited by over six million people a year. The required safety drill followed lunch. When I asked where the lifeboats were, Captain Chazot laughed, because for most of our trip the water wasn’t deep enough for the boat to sink. My third floor would still be above water and the crew would have us jump in and walk to shore. 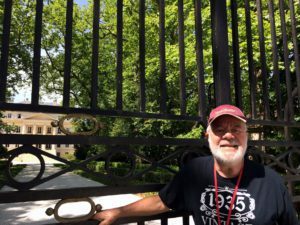 We left Bordeaux at Noon for Cadillac, cruising the Dordogne and Garonne Rivers and arriving at 3:30 p.m. Later in the afternoon we went for a Sauternes tasting. Dinner was followed by a wine lecture in the lounge, showing the different Bordeaux varieties. Monday morning we had a Cadillac city walk. 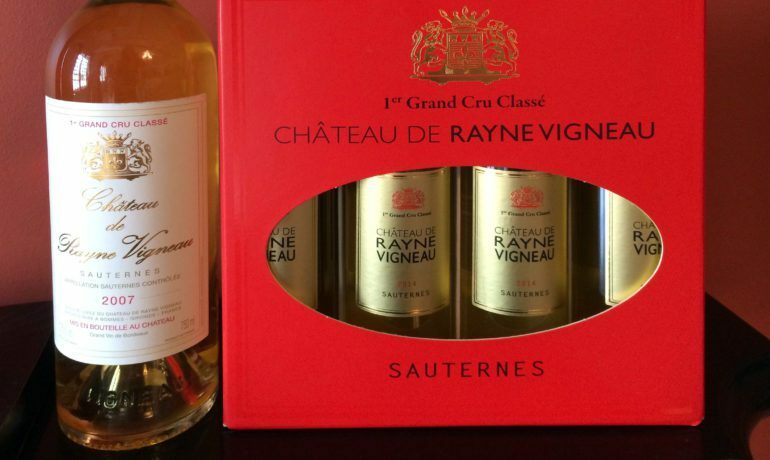 It’s a charming city directly across the Garonne River from Sauternes and is known for producing sweet dessert wines under the Cadillac AOC designation. At 10:30 we left for Libourne. The free time before lunch was my opportunity to interview both the chef and food and beverage director. Chef Cesar Mata was born in Portugal and attended the Lisbon Hotel School. He has worked at the Ritz Hotel Lisbon and for 5 years was at Caesar Park Hotel in London, followed by 11 years at Marriott. He has been the part-time chef for the Portuguese national soccer team for eight years. This is his second year with Viking. He likes the fact that he gets time off for family visits. 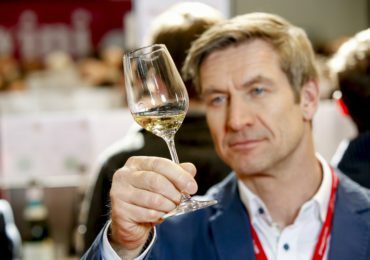 Food and Beverage Director Imre Csongradi has a wife and young daughter in Budapest. He attended the Hungarian Economic University. He has worked on the Celebrity Saltise and at the Four Seasons in Budapest, plus one year in Dubai. 3½ years ago he joined Viking and again he liked the time off to spend with his family. He worked on the North Seine, Rhone and now the Bordeaux cruise. After lunch the chef had a cooking demonstration on making macarons — my nut allergy prevented me from tasting any. Before dinner, there was a Bordeaux presentation. I discovered my room TV had a channel for the lounge. When I wanted to stay in my cabin I could still watch the presentations. Every evening right before dinner the Social Director gave a presentation outlining the following day’s program. We overnighted in Libourne, arriving at 7:15 p.m. 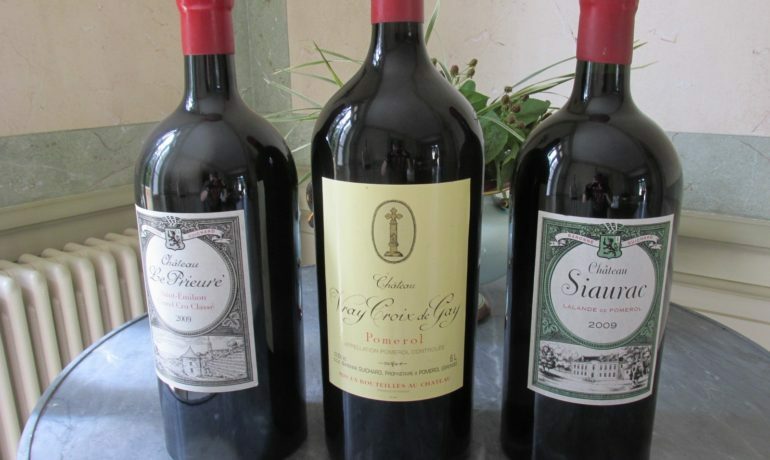 The next day was my first optional tour, a full day (9 a.m.-5:30 p.m.) of lunch and a tasting of the wines of Pomerol and St. Emilion. Our lunch was at Chateaux Siaurac with the proprietor Paul Goldschmidt. There was a 1½ hour walking tour of Libourne, including the farmers market. A walking tour of St. Emilion followed. I visited the church and then broke off from the group for a trolley ride through the vineyards ($10). The city of St. Emilion (another UNESCO World Heritage Site) had a lot of hilly streets with cobblestones throughout. After my trolley ride, I took a short walk through the local wine shops near our bus location. Somehow a couple got lost and missed the bus back to the ship. We left for Bourg at 6 p.m., arriving at 8 p.m., where they caught up and joined us. On day five we had a Blaye City Walk at 9 a.m., including a visit to the Citadelle de Blaye, a UNESCO World Heritage Site. This was part of my second optional tour to Cognac. We went to Caymus, which is privately owned. Hennessy, Courvoisier, Remy Martin and Martell produce 85% of the world’s Cognac, with Hennessy being the most predominant. After learning the distillation process, we blended our own Cognac from the four main regions. Mine was 20% Fin Bois, 15% Borderies, 30% Petit Champagne and 35% Grand Champagne. Day six we left Bourg at noon. I walked a few blocks into town but there was really nothing to see or do. We cruised the Gironde River and arrived in Pauillac at 1:30 p.m. After lunch (2:30-6 p.m.) the passengers split into four groups, each to visit different Margaux chateaux. Mine was Giscours. There was a photo opportunity at Chateaux Margaux and we all met at 5:30 p.m. at Chateaux Kirwan for dinner. The chef and dining room staff brought everything needed to Kirwan. The only thing missing was air conditioning; it was warm inside the dining room. On our last full day, there was a change of plans. We left Pauillac very early (5 a.m.) because of a change in tides, and arrived in Bassens, an industrial park, at 9 a.m. I canceled my private tour of Lafite Rothschild since we were now an hour away. It should have been 10 minutes if not for the tidal changes, and a taxi would have cost me $75 each way. We arrived back in Bordeaux at noon. I learned that the city was also a UNESCO World Heritage Site. After lunch, I walked the half-hour along the Chartron to my appointment at the City of Wine. 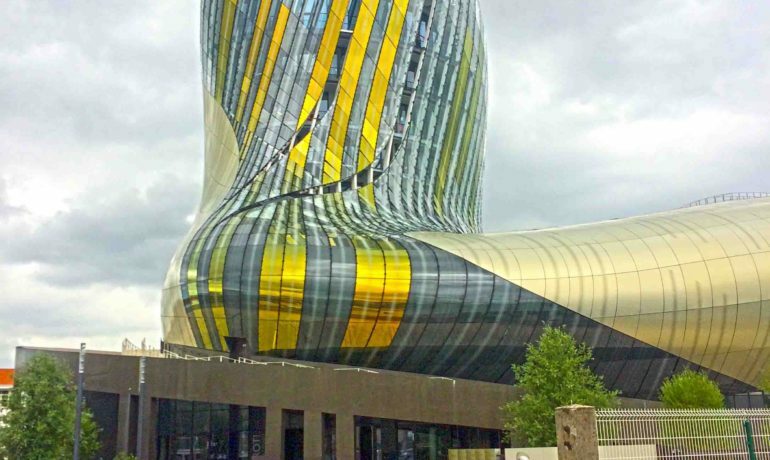 This futuristic structure is one year old and has already been visited by over a half-million people (80% French with the rest mainly from the U.S. and Great Britain). On the main floor, there is a bookshop, wine bar, and casual restaurant. 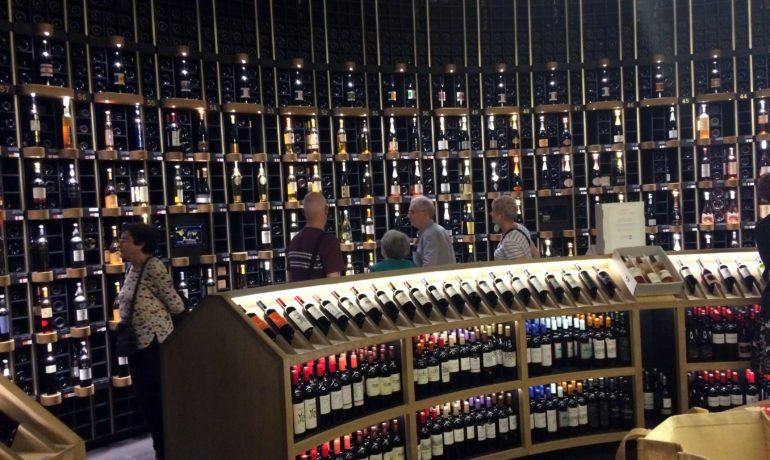 The wine boutique has over 14,000 bottles from 80 countries. On the second floor, there are exhibition spaces, including a circular room with 360-degree projections plus an explanation of the entire wine process. Everything there is interactive. The 8th floor has a wine bar with a glass of wine included in the price of admission ($22.50 US). Everything in between is office space There are fabulous views of the Garonne River and the Port of Bordeaux. I rode the tram two stops back to the ship. Our farewell toast by the executive staff was followed by our final dinner. Saturday morning it was bags outside the door and we were off to the Bordeaux airport. In Paris, there was a layover of a few hours before my return flight to JFK. Thank you Air France for allowing me to use your lounge! The trip overall — Five Star plus. Great food and lots of wine (I never eat three full meals at home). I will get on the scale in a day or so but am afraid to look. Every employee was friendly, helpful and courteous. I was told they choose less experienced workers who have a winning personality and then train them. Most of them are eastern European — Bulgarian, Croatian, Serbian etc.